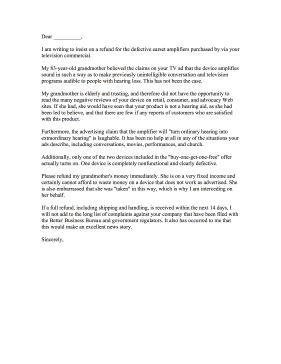 Demand a refund for a faulty or misleading product with this sample complaint letter concerning hearing aids. I am writing to insist on a refund for the defective earset amplifiers purchased by via your television commercial. My 83-year-old grandmother believed the claims on your TV ad that the device amplifies sound in such a way as to make previously unintelligible conversation and television programs audible to people with hearing loss. This has not been the case. My grandmother is elderly and trusting, and therefore did not have the opportunity to read the many negative reviews of your device on retail, consumer, and advocacy Web sites. If she had, she would have seen that your product is not a hearing aid, as she had been led to believe, and that there are few if any reports of customers who are satisfied with this product. Furthermore, the advertising claim that the amplifier will "turn ordinary hearing into extraordinary hearing" is laughable. It has been no help at all in any of the situations your ads describe, including conversations, movies, performances, and church. Additionally, only one of the two devices included in the "buy-one-get-one-free" offer actually turns on. One device is completely nonfunctional and clearly defective. Please refund my grandmother's money immediately. She is on a very fixed income and certainly cannot afford to waste money on a device that does not work as advertised. She is also embarrassed that she was "taken" in this way, which is why I am interceding on her behalf. If a full refund, including shipping and handling, is received within the next 14 days, I will not add to the long list of complaints against your company that have been filed with the Better Business Bureau and government regulators. It also has occurred to me that this would make an excellent news story.